By finishing his MACH in February 2011, Diesel became the AKC's first DC VCCH. These titles mean he has championships in five different venues: bench, field, obedience, tracking and agility. His registered name with all his titles is DC VCCH Can OTCH Can VCh Regen's Rip Stop UDX5 OM MH Can FDX Can TD SDX RDX VX7 NAVHDA NA Prize 1. That summarizes what he has achieved, but now I will tell you the rest of the story. He was born in May 2002 and came to my home as my first competition dog in July of that year. From the beginning he was amazingly focused, smart and eager to please. I recall working with him for hours on end and he never faded his attention or wanted to quit even as a young pup. He wasn't interested in playing with other dogs or even much interested in playing with me. He's always been very goal oriented and just wanted to work, work, work. Because of this ability to focus, he learned all his obedience exercises through utility by the time he was six months old. He started with a bang, finishing his OTCH at three years of age, spending 2003-2009 on the WCA top ten obedience list (four years as #1). 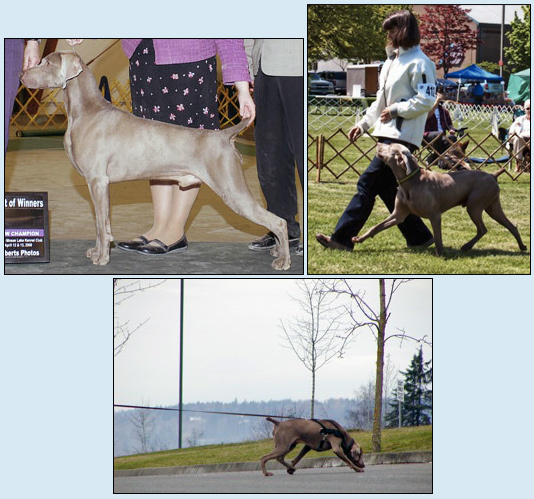 He set a new record for Weimaraner lifetime OTCH points before he turned four and has earned more than 30 High in Trial wins and nearly 20 High Combined awards. He qualified to represent the breed at the AKC Obedience Invitational five times. While he loves all activities, he lives to hunt. I took him out on wild pheasant and quail as a youngster. He was a leaf turner at first. Checking every patch of cover and every inch of the field. I thought to myself he would never make a field trial dog. However, he soon learned to run the hedgerows and use the wind to his advantage and by the time he was seven or eight months old he was ranging out with the big dogs. I took him hunting with a few die-hard hunters when he was a youngster. 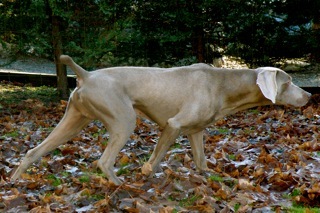 Many hunters with other breeds are a little skeptical when you show up with a Weimaraner. Thankfully Diesel was able to convert all the hunters we spent time with. One man I hunted with said to me that we should always follow Diesel because he's true on birds. He'd follow Diesel instead of his own German Shorthair pointers; and we were not sorry. On a different trip with a different hunter, we spent about five hours hunting the chukar hills and when we were done Diesel had found all the birds for the day and his English Setters had gone birdless. Showing that he's not just a good bird dog but also a true versatile hunting boy, twice during these trips as a pup he found and tried to retrieve dead deer. I remember looking for him one time and peeking over the edge of a steep hill. There he was tugging on the leg of the deer trying to pull it up the hill. It was a sight to see and it took some convincing to get him to leave the deer where it lay. Diesel began his field career with a 2nd place in his field futurity as a nine-month-old puppy. He then earned a maximum score on the North American Versatile Hunting Dog Association's Natural Ability test. Later that year he went on to win the WCA Mid-America Classic Derby in Nebraska. He also earned his Retrieving Dog Excellent rating as a one-year-old pup. He proved equally talented as a broke dog by winning the WCA Western Classic Amateur Gun Dog in 2006 in Colorado, placing fourth at the WCA National Amateur Championship in 2008 in Oklahoma, earning perfect 10's on his last leg of Master Hunter and garnering multiple placements in all-breed field trials. He completed his field trial championship at the age of four. After finishing his obedience and field trial championships, Diesel began to enter the show ring seriously on the quest for a Triple Championship. His conformation is correct and he's a clean mover but he's a short and stocky boy; not your typical show specimen. What he does have is very clean movement, an affinity for free stacking and he's the consummate showman. He's just got that winning attitude. If you asked Diesel, he'd tell you that everyone at the show was there to see him. He was handled in the ring for the most part by co-owner Judi Voris and friend Kerry Edinger. He finished his bench championship and Triple Champion title at the age of five. The variable surface tracking title was his next challenge. We had been working on variable surface tracking for some time but the two of us together had just not quite figured it out. It took a few lessons with Steve White, a police dog handler, to get us back on the right track. After some very insightful pointers from Steve we were off and running with the VST. Tracking is not Diesel's first love and I truly believe he did this one for me. He's got a heart of gold and will never quit. A deep nosed and very serious tracker, Diesel completed his VST track in 22 minutes, complete with interference by two different squirrels. The second squirrel ran right across his path within 30 yards of the final article. True to form, he was able to re-focus and get right back to work. He completed his Champion Tracker title at the age of six. After completing the tracking championship Diesel got to work on his Agility Championship piloted by co-owner Judi Voris. He was a crowd favorite and had a few clownish moments along the way. He always liked to fetch his leash at the end of the run and in one memorable run he fetched it mid-way through the course only to drop it on command mid-stride and complete the course. Another time, earlier in his career, he jumped on the scorer's table at the end of the run when he could not locate his leash elsewhere. Despite these shenanigans, overall he was a consistent worker and finished his MACH February 19th 2011 at the age of eight. Diesel has passed on his versatility to his kids who have Ch, AFC, OTCH, MH, TDX, MX/MXJ and NAVHDA NA Prize I titles to their credit in addition to being regulars on the WCA Top Ten Gun Dog, Obedience and Agility lists. When he's not working Diesel loves to play with his stuffed duck, enjoys sleeping snuggled up under the covers and picks up all the dog bowls after breakfast and dinner are done. He is also a great alarm clock and has a unique way of worming his way underneath my neck until I am nearly sitting when he thinks its time to get up. He is a joy to live with (unless you want to sleep late) and would be a favorite even without all his titles. Diesel has a giant personality in a powerful package. I have enjoyed the journey every step of the way. He's a once in a lifetime boy.